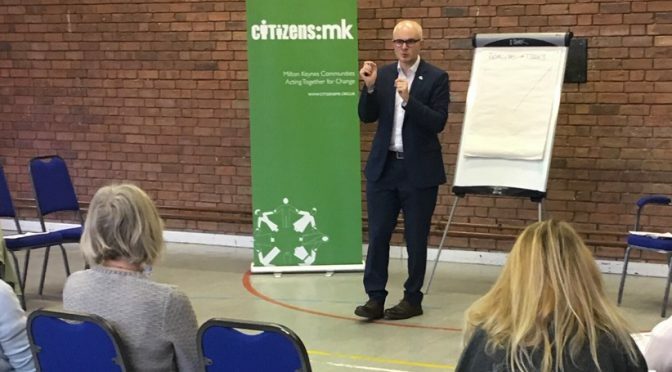 18 leaders from 10 civil society institutions, including 7 member institutions, attended Citizens:mk’s first ever Study Action training morning. The session was led by Jonathan Cox, Deputy Director of Citizens UK. 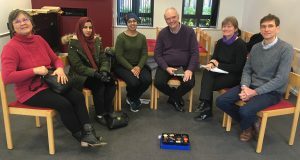 Building on the methodology of community organising, the aim of the session was to bring leaders together to organise a ‘study action’ in January from which all would learn best practice for their own campaigns and institutions. The theme was ‘unfairness in the workplace’ and the session began by hearing a wide range of testimonies from participants about injustices they had experienced at work, led by Hala Afify’s story of Zero hours contract termination. Other issues highlighted included discrimination in screening of job applications, uncertain probationary arrangements, unfair notice arrangements, lack of pay for work travel time and low pay generally. Plan a strategic response to the issue – identify the problem, break into an issue which winnable and worthwhile, who are the people with the power? Get a seat at the table and Negotiate. 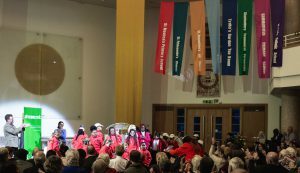 One of the ideas emerging was that Citizens:mk might target local employers to lead a new ‘Community Jobs Compact’ (like the one organised by Wales Citizens), including fair recruitment practices (name/address blind, maybe age too) and Unconscious Bias training for interview panelists, Real Living Wage and secure contracts and progression opportunities for workers. The group resolved to undertake an action to find out more about the experiences of workers at MK Dons’ stadium (stewards, caterers, cleaners) on Saturday 5th January 2019. 10 leaders agreed to meet for lunch at 12.30pm in IKEA, then proceed to the MK Dons v Oldham football match, talk to stadium workers, and evaluate soon after the game ends at 5pm. If you or anyone you know is interested to join this research action, please contact Community Organiser Tom Bulman.